Introductions to reading the Bible are almost as old as the scriptures themselves, but most of the recently published introductory biblical textbooks focus exclusively on either the Old or the New Testament. In contrast, READING THE BIBLE takes the unusual approach of serving as an introduction to the Bible as a whole, helping the reader understand the Bible as a single entity. In a practical, engaging manner, this book provides a survey of the entire Bible, its sections, its books, and its social, religious, and historical contexts. 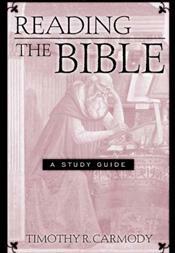 Then it also serves as a primer in the methodologies of biblical interpretation. And last, it is a workbook, giving examples of how to use the background knowledge from the survey and methodological training to examine in some depth a few selected texts. Drawing on his longtime teaching experience, the author shows readers how to approach the biblical text in a direct, fulfilling and honest manner in order to better understand and interpret it. And he demonstrates that by examining the Bible's historical background, its literary features, and the interpretive possibilities for the text, READING THE BIBLE is the ideal introduction to modern biblical scholarship.